What follows is an extract from a submission about religious freedom, submitted to the Australian Federal Parliament by my friend, Rev. Michael Palmer. The submission was based on what we saw and heard during our trip to Syria over New Year 2017. On New Year’s Day 2017 the Grand Mufti of Syria joined the Service of Holy Communion at the Mariamite Cathedral in the old City of Damascus. Of course, the Grand Mufti did not partake of the Eucharist/Holy Communion but his presence was welcomed and his respect of the unfolding service gracious. Following the formal liturgy both the Mufti and the Patriarch addressed the congregation about the importance of working together in the rebuilding of Syria, and of their common belief in a God of love. Their concluding warm embrace spoke, every bit as eloquently as their words had, about the accepted place that they both enjoyed in Syrian Society. The Syrian population is majority Muslim with a sizeable Christian minority. The Syrian crisis has led many Syrians, both Muslim and Christian, either to be displaced internally or to flee their country as refugees. The affiliated Syrian opposition groups have united under banners of ‘Democracy’ and ‘Freedom’ however the evidence is mounting that Freedom of Religion, and more generally the respect of Human Rights, in ‘rebel held’ areas are diminishing. In one ‘rebel-held’ area the ‘Pact of Umar’, which contains a list of rights and restrictions on non-Muslims has been reinstated. Among many other restrictions the Pact of Umar refuses the building or the rebuilding of churches and any show of Christianity in public. Maria Saadeh, a Christian Architect, and former independent member in the Syrian Parliament, says that the ‘Affiliated Syrian opposition’ groups use the words ‘Democracy’ and ‘Freedom’ as mere slogans to attract western sympathy but that their real intentions is to limit the freedom of Religion. While in Syria we heard Maria’s words repeated by many, both Christian and Muslim, and also from State and Religious leaders, as they perceived the real war of ‘the rebels’ to be one that raged against Syria’s long history of religious tolerance. Contemporary religious speech must be based upon the priority of respect for the human psyche and maintenance, and the sanctity of blood and money, and honours, and freedom of belief and thinking. Prevent the exploitation of the religious speech to serve trends or personal and factional political interests. Gathering all the energies of the society to tackle the extremist ideology and uncontrolled alike, and support the work and production issues, social justice, anti-corruption, and the elimination of unemployment and poverty in order to blow up the energies of society and creations in order to access the security, stability and prosperity and a decent living under True Islamic Thought. Implications for Australia from this Syrian Window. Listen widely and cautiously when evaluating Freedom of Religion violations. There are indicators of a long history of religious tolerance in Syria. Whether Christian or Islamic, there are ancient places of worship, the existence of vibrant Communities of Faith and public symbols of religious tradition. Laws exist to both protect and also to promote various Communities of Faith. However the media messages, both in pronouncements and pictorial images, often suggest otherwise. Unfortunately the Media is increasingly considered an unreliable source. One Christian Priest beckoned, “For all the media, just to seek the truth.” but lamented that, “Most of the time the truth is not told, actually the opposite. There is an Arabic saying that lying is the salt of man, but we say now it is the salt of the media.” The Syrian crisis is confusing with contradictory information emerging and so in assessing the various truth claims or reported violations of Human rights there is a need to develop trusted sources of information and then to constantly re-assess those sources. The evaluation of Freedom of Religion must be built on actual realities and not pronouncements. The Law of the state is essential in allowing diverse groups to flourish in a coherent and peaceful mosaic. A variety of diverse religious or non-religious groups always exist in healthy societies. These ‘first level’ associations provide a sense of belonging and, especially when referring to religious groups, provide insight and motivation which cannot be restricted to our private or leisure life. It is an important role of the state to allow religious groups to flourish by providing the laws and principles that can define boundaries of suitable behaviour and sometimes broker conflict resolution. Syria’s ‘A Charter of the Religious Honour’ is an example of a state seeking to encourage Freedom of Religion in a diverse religious context. Overall, ‘all sorts of civil associations, have a natural liberty to exist and organise themselves, and the state’s role is to harmonise and, to some degree, regulate this social variety’. 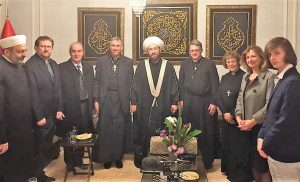 (2) While in Syria the delegation was challenged to encourage the Australian Government to be diligent in monitoring and limiting any religious groups that sought to destroy the harmony of society. In particular we were warned about The Muslim Brotherhood and the Takfiri Wahhabi movement however beyond labels the state should be wary of any group, or teaching, that incites division and violence. which seeks to silence, by any means, other religious groups, or even contrary voices within their group, is operating ‘from its weakness by dismissing out of hand the capacity of its Faith to engage transformingly with the social and imaginative world around it.’ (3) A robust Faith Community will not fear difference nor be violent against contrary voices. A robust State will allow, within the rule of law, the Faith distinctiveness of religious groups, whether their institutional presence is tiny or ubiquitous. In the Syria Government controlled region of Syria our delegation was impressed by a peaceful coexistence of religious groups. The right to both ‘believe’ and to allow others ‘to believe to the contrary’ was seen by our delegation. Within the boundaries of a law abiding civil society, the state’s role in allowing communities of faith to flourish, even with outward displays of distinctiveness, will not foster a militant faith but rather religious institutions which will trust their futures unto a God whose existence is not dependant on policies of oppression or coercion. (4) The lesson here is that the state should encourage Faith communities to be engaged in dialogue with one another, and together, with the state. It is important for the state to allow as broad a participation of religious, and other ‘first level’, groups when encouraging discussion about shared aspirations for a decent society. In should be noted that the Syrian State has identified religious groups that are unwelcome in discussions towards the building of a decent Syria. While the Syrian context seems to justify this, religious groups should not be disqualified without reasonable cause from building community lest, on the one hand, society be deprived of an important piece of the community mosaic or, on the other, that sections within those disqualified groups become radicalised, and develop a weak and hence militant Faith. Bishop George Abou Khazen, Apostolic Vicar of Aleppo January 2017. (2) Rowan Williams, ‘Faith in the Public Square’. Chapter 6, ‘Religion, Diversity and Tolerance’, page 80. (3) Rowan Williams, ‘Faith in the Public Square’. Chapter 5, ‘Europe, Faith and Culture’, page 73.